Over the course of nearly three decades we have created a body of work that is internationally recognized as complying with the highest standards of good practice in the fields of recording, documentation, and information management of heritage places (Letellier 2007, 2011; Eppich and Chabbi 2007, 2011; Van Tilburg, Arévalo Pakarati, and Hom, 2007, 2011; Van Tilburg 1990, 1993). The senior researcher of this proj­ect (Van Tiburg) has directed archaeological teams that received prestigious State of California conser­vation awards. She has also served as an archaeological consultant to the U.S. National Park System and as a two-term appointed member of the United States National Park System Advisory Board, Land­marks Committee, National Trust for Historic Preservation. Cristián Arévalo Pakarati is a graphic designer and artist who has participated in dozens of international field teams and has been associated with this project since 1989 and co-Director of it since 2000. The EISP field offices are manned by current and past UCLA students and graduate students in art history, archeology, and anthropology who have been trained and led by Van Tilburg and the staff of the UCLA Rock Art Archive. EISP field survey and excavation teams are nearly exclusively Rapa Nui, many of whom have participated in other archaeological projects. The Easter Island Statue Project (EISP) shares the commitment of the Rapa Nui community to their goal of heritage preservation and management. DATASHARE is structured to further heritage management efforts conceptualized and directed by Chilean and Rapa Nui agencies, not to compete with them or replace them. Through our work, we are also able to provide economic and advanced educational op­portunities to members of the Rapa Nui community who wish to work with us. The highest standards of participation are maintained at all times. DATASHARE is a private archive dedicated to the preservation of the monolithic stone statues (moai) of Rapa Nui. It was originated and compiled by Van Tilburg and Arévalo Pakarati out of the Easter Island Statue Project (EISP), which has been conducted as a surface survey first with the Universidad de Chile and then subsequently with review and confirmation of the proper Rapa Nui authorities, originally con­stituted as the Consejo de Ancianos. EISP and DATASHARE are solely funded by Van Tilburg and Arévalo Pakarati through donations and grants. Both projects are extensively described, published and presented for critique in professional meetings and various national and international publications. Passwords to open access of our data are provid­ed to our research collaborators as well as to CONAF, Rapa Nui and CNCR, Santiago de Chile. Semi-duplicate databases have been collected subsequently to Van Tilburg’s (1986) dissertation (Shkepardson 2006). These data are posted as an open access database (www. terevaka.net). EISP has no connection with any other database and are not responsible for errors of omission or commission in any other database. Nor are we responsible for problems of access to public and private lands which may arise from such open access to data. The EISP excavations summarized here follow completion of our extensive mapping (Van Tilburg et al. 2008, Van Tilburg and Arévalo Pakara 2009) and are the first legally permitted (CMN ORD 5467-09) and monitored, controlled excavations in Rano Raraku interior quarry since 1954. Our project is also the first stone conservation and preservation pilot program ever conducted anywhere in Rano Raraku. Pre­viously, all but one of the 22 standing statues in Rano Raraku interior, including those described here, were disturbed or exposed through unscientific and undocumented digging. Furthermore, over 90 stat­ues throughout Rano Raraku interior and exterior were disturbed from 1868 to 1989. This vandalism is deplorable, although our database mitigates at least some of it. We presume that the interior of Rano Raraku quarry is a discrete environment with a distinct history of use that is related to but separate from that of the exterior. We presume that the paleo-environment of the quarry interior can be documented as a discrete en­vironment using modern tools and technology. Further, we presume that the day to day fluctuation in weather conditions within the interior as defined by precipitation, wind direction and velocity, and temperature has an variable effect on statue stone surface which may impact moai conservation and can be monitored and mitigated. We presume that the slope upon which our excavated statues stand covers earlier quarries, and that these quarries may be located and dated to the earliest statue carving activity. We presume that the suggested date of A.D. 1300 for the commencement of statue carving in Rano Raraku interior followed at least a century of partial deforestation of the interior. How did symbols interact with belief in order to capture the creative imagination, encourage co­operative social action, and promote sustainable production sufficient to achieve megalithic construc­tion? What was the pulse of community change over time in a limited natural environment, and how did artistry, as reflected in sculpture, contribute to or mitigate that change? We discern, first, an overall continuity in material selection and object situation and an association of statue numbers, sizes, styles, embellishments and technological innovations with variant terrain and two ethnographically known geographical/political regions. Secondly, these consistently articulated, regional distribution patterns are also present in the special use areas of Orongo (Rano Kau) and Rano Raraku. We hypothesize, therefore, the interaction of locality with universality. That is, the moai was the universal ideal objectifying a narrative of differential status but also embodying multiple, particular stories that localized shared history. The target statues for this project (RR-001-156 and RR-001-157) were, so far as we know, first disturbed by the Mana Expedition to Easter Island in 1914-15 (Routledge 1919: Figures 70-71). Other intrusions by the Franco-Belgian Expedition (1935) and the Norwegian Archaeological Expedition (1954-55) fol­lowed. None of these activities reached the base of either target statue and no scientific reports were produced by anyone involved. The target statues are of high archaeological value due to complex dorsal petroglyphs, previously par­tially exposed but never documented. These carvings are formally different from those on the dorsal side of BM-MOM-001, a statue in the British Museum (Van Tilburg 2006; Van Tilburg and Arévalo P. 2012). 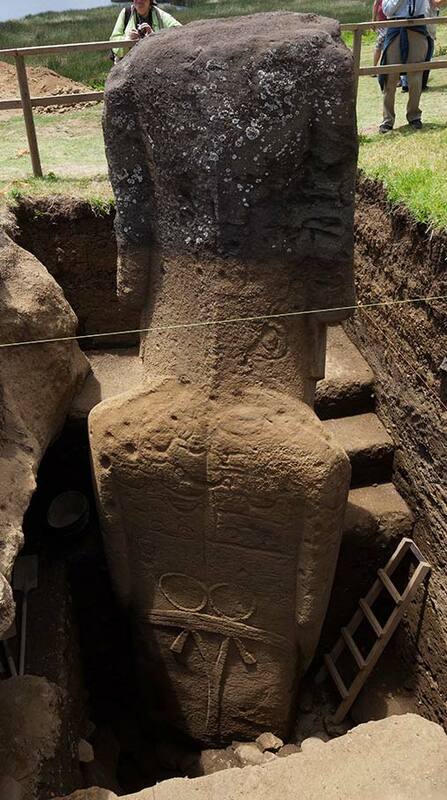 We ac­complished laser scanning of the British Museum statue (www.eisp.org) but our proposal to do the same with the target statues was rejected by the Consejo de Mon­umentos Nacional Isla de Pascua. We were thus forced to document the petroglyphs through digital photogra­phy, metrics, and scale drawings. Statue RR-001-156 was 1.32m above ground in 1990, 2002, and 2004 and 6.60m total height. Statue RR-001-157 was 3.17m above ground on the same dates and 7.16m total height. Sections depicting the existing grade to 3m depth were augmented by historic photographs and metrics to produce a series of digital composites providing an overview of historic levels. This allowed us to correctly estimate soil level changes from 1914 to the present. We then calculated soil accumulation rates at about 1cm per year for 80 years. This suggested where we might discern previous intrusions in the stratigraphy. Deposition levels suggest that the target statues were created at more or less the same time and were upright in place for c.500 years. We removed and screened overburden at the back of Quarry 2 on a sorting board. 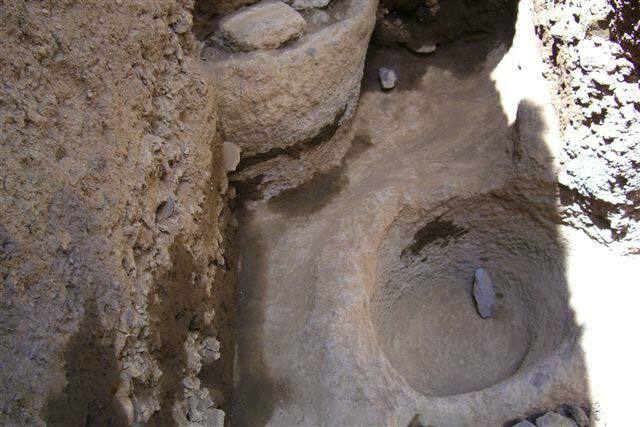 We also excavated a directly as­sociated umu pae and an adjacent hare paenga foundation. Backdirt from each individual excavation was isolated. De­posits in squares more distant from the statue were removed with square head shovels and trowels. Smaller tools were frequently required. The Excavation Finds Log assigned a pre-printed number to each field object collected, and materials classifications were established for level bag collections. All toki, of which 917 were collected, were measured in a standard manner and individually photographed. An X-ray florescence (XRF) study employing 168 of the implements was initiated for comparison with 40 measurements taken on 4 basalt quarries, basalt inclusions in 5 moai, 1 ahu, and 30 other basalt flow locations. Two flow charts illustrate our conjectural basalt selection and tool production stages for toki. Several examples of an interesting object that may be a scribing tool were found in association with both statues. They are either basalt or obsidian and consist of a rough and varying shape with a single, sharp and flaked point. Their fortuitous shapes recall the varied shapes and flaking techniques used to make mata’a. One basalt mata’a was recovered, as was 800g of red pigment. The pigment was delivered to MAPSE. The next step is to test it to see whether, in fact, it is solid pigment or pigment compressed around a solid core object. The shape suggests that the core object, if such exists, is a toki. Samples of both carbon and bone were identified at nearly all levels by both digging and screening, and were collected with gloves and/or metal tweezers and stored in archival safe plastic vials. The dates of most recent fires in the interior of Rano Raraku are recorded in the EISP archives by reference to his­toric photographs. Routledge (RGS/WKR) reported carbon “just below the surface,” at the “5 inch level at 4 feet” from the back of one of our target statues, as well as “at the 18 inch level” and at what she says are 2, 3, and 4 feet levels (Van Tilburg 2003). We found quantities of carbon throughout previously excavated levels. Below her 4 foot level the carbon was in unexcavated levels. The next step is to re­quest permission to remove carbon and obsidian materials samples from the island in order to conduct scientific dating tests. In all cases, the obsidian required is in the form of unmodified flakes and chips, not archaeological objects or artifacts per se. 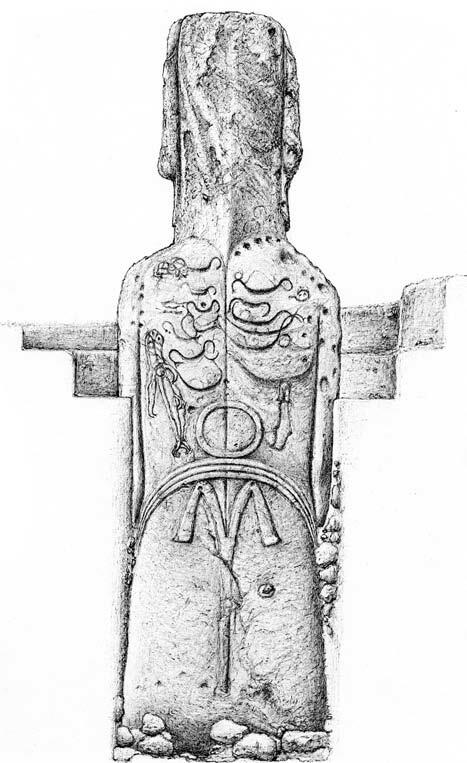 Routledge’s unpublished notes (WKR/RGS4/9; Van Tilburg 2003) report at least one burial located “at the level of the bas-relief ring design” for RR-001-156. She described the remains as follows: skeleton of which long bones, base of skull and patella were identified. Position: head to the right of the statue and long bones to left of statue. In the process of attempted removal Routledge or someone working with her damaged the bones and then, presumably, they were returned to the excavation. However, we recovered a large fragment of either a patella or skull during our first field season in one of the carving canals of Quarry 2 located be­hind RR-001-157. It is probable that Routledge or someone with her cast some bones aside rather than replacing them in her excavation. The most interesting features as­sociated with both statues were revealed at and under their bases and in bedrock between the two statues, an area previously unexamined. A large and deep posthole with abrasion marks, along with rope guides, was cut into bedrock. Presumably used to lift statues upright, these features appear to have been used to remove statues prior to those currently excavated. Strati­graphic drawings for both statues reveal intrusion levels from previ­ous investigations and confirm that our excavations reached previously untouched levels. In addition, careful study of color and discolor levels on the statues at previously submerged levels confirms the intrusion levels. On 26 April 2010 our project was interrupted and our site vandalized by persons claiming to be part of a dissident group making political demands centered on immigration reform and land rights issues. Our conservation initiative goals, as a consequence, were interrupted and redirected. Due to the actions of these few, the island as a whole lost the anticipated benefits of our study and the interests of conser­vation were subverted. Our personal and professional relationships with some of the dissident group were never at issue and subsequently, one of the perpetrators was hired by EISP to be part of our field crew. 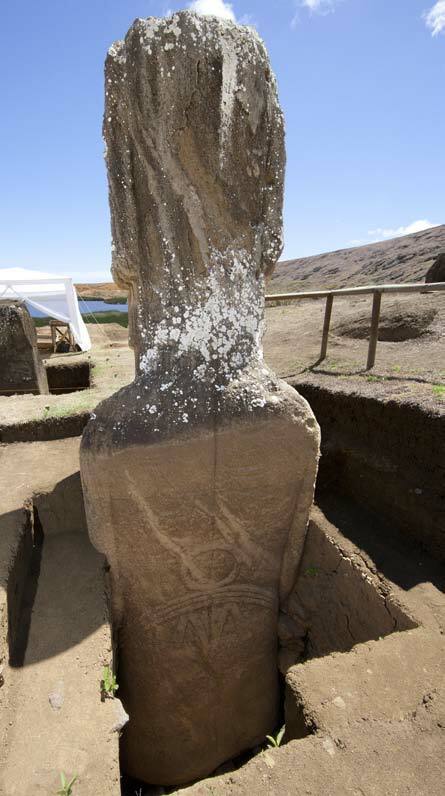 This report summarizes the most recent season of work in Rano Raraku quarry by the Easter Island Statue Project (EISP). It provides a synthesis of activity and a synopsis of artifactl findings. A complete report of all objects collected is forthcoming with our final report at the end of our permit period in December, 2014.